I always enjoy making (and eating) fajitas, so a recipe for Slow Cooker Steak Fajitas caught my attention. I planned on using this method of fixing the fajitas, until I thought through a couple of things. First, the recipe called for two pounds of beef, enough to serve six. I only needed to serve two, so I bought a half pound of flap meat. Second, the liquid that was necessary to cook the meat in the slow cooker was salsa. I enjoy salsa, absolutely, but not as a central ingredient in my fajitas. 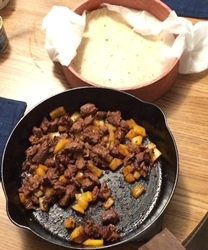 What I ended up doing was cooking the meat and bell pepp er in my cast iron skillet, but I used the homemade fajita seasoning specified in this recipe. The result was delicious, so I have to give Shannon at FitSlowCookerQueen full credit for that. I served the fajitas with tortillas that were a combination of corn and wheat, something that I pick up at Sprouts. 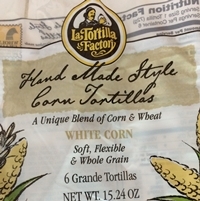 They are quite tasty, and they are less inclined to fall apart than the normal supermarket corn tortillas. They are also larger than the normal corn tortilla. It made for a really good dinner.